Star Wars fans can now eat special toast for breakfast thanks to this Chewbacca Toaster. The Star Wars toaster is brown and has the hairs of Chewie printed on it and his belt too. 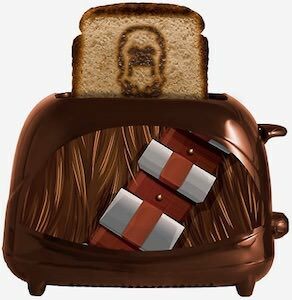 The toaster can make two slices at once and each will get the head of Chewbacca burned into the bread. The Chewbacca toaster has rubber feet to make it stay in place and you can adjust the toast level and the crumb tray makes it easy to clean. No need to eat boring toast any more because Star Wars fans will love Chewbacca toast much more. Now there is the perfect toaster for your breakfast as this is a Batman toaster. The toaster is black on the outside with in gray the Batman logo on it and that is not the only place where you will be finding the famous bat symbol as it will also burn the logo into the bread. Now you can have a superhero breakfast because this Batman toast is great in taste and looks even better thanks to the logo burned into your bread. 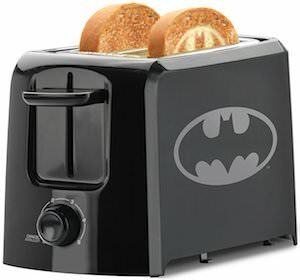 I am sure that all the Batman fans will like to make toast now so think about this when you are looking for the perfect present for a Batman fan. 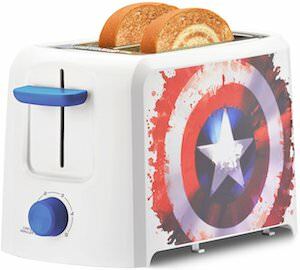 If breakfast includes toast then you just have to check out this Captain America toaster. The toaster looks like most toasters and it white with blue controls and the shield of Captain America on the side and the toast also has the shield on it as it burns it into the toast so that you can feel like a superhero while eating toast. The two-slice toaster is like most toasters only this one is a Captain America toaster and that adds to its cool factor. And the Marvel toaster has a crumb tray so that it is easy to clean. Now you can toast your bread in this Mickey Mouse toaster. 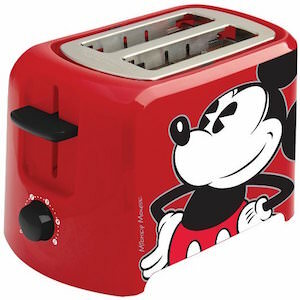 The toaster is perfect for toasting two slices of bread just like any other toaster but this one is not so boring as it is red and has an image of Mickey Mouse on the side. Just imagine replacing that boring old toaster with something way more fun like one that is red. Mickey Mouse of course is a classic by now and that is why adding this to your kitchen is adding some Disney class to your kitchen. Breakfast is that one meal of the day that really can use some toast and OK toast is great but looks so boring. If you are a Spider-Man fan then boring is a thing from the past because now you can have Spider-Man toast. This Spider-Man toaster makes toast with a big spider burned into the bread. And besides that spider the toaster is more fun to. First of all the toaster is red and has a picture of the Amazing Spider-Man on it. Spider-Man of course tries to keep the toasting clean but we all know that toasting bread leaves crumbs and that is why this Marvel toaster has a crumb drawer so that you can easily remove them. 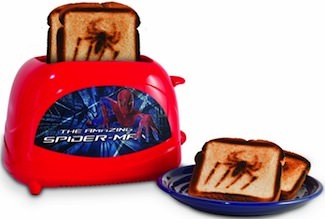 No more boring breakfasts, get your The Amazing Spider-Man Toaster. If you like toast then you are gone love this toaster. This winnie the Pooh toaster is special. First the outside, there is afun picture of Winnie the Pooh and Tigger on it and a cute little be ad bread lever. But then when you first toast comes out your notice that your slices of bread now have a picture of Winnie and Tigger on it and when the toast is ready the theme song of Winnie the Pooh will play. 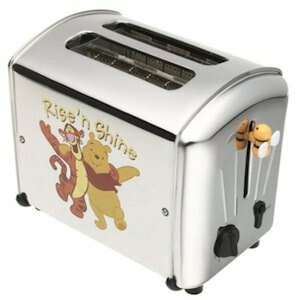 This toaster is a must have item for someone who like Winnie and Friends and toast. So if you get hungry for toast then come and order this Disney Winnie The Pooh Toaster. Even the master of the dark side needs to stop and have a little bite to eat. Star Wars fans you need to check out this Darth Vader toaster a nice sleek black fully functioning toaster with dual slots. The best part is every piece of toast will be imprinted with the dark side master himself Darth Vader. 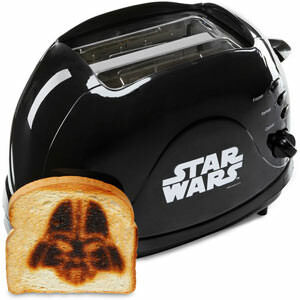 Find your Darth Vader Bread Imprinting Toaster. This is one of those items that are so super cute that a real Hello Kitty fan can not live without one. What do you think about a Hello Kitty toaster? Probably no real feelings about that. 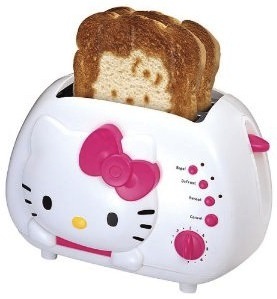 But what about a really nice looking Hello Kitty Toaster that even toasts Hello Kitty on each slice of bread? Yes I knew you wanted one so go and check out all the features of this toaster and see how cool the Hello Kitty Print on the bread looks. Get your Hello Kitty Toaster.